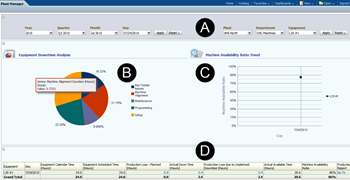 This dashboard shows downtime reasons machines in one or all departments of a plant within a selected period (A). The pie chart (B) below the selection area outputs the percentage distribution of downtime reasons. Moving the mouse over one of the items opens a small window with the amount of hours. In the graph on the right side (C) the machine availability ratio trend on a percentage basis is shown. The table (D) below contains the following details for the selected equipment in hours per day: equipment calendar time, equipment scheduled time, production loss - planned hours, actual down time, production loss due to unplanned downtime, actual available time, machine availability ratio in percentage terms and a link that leads to the dashboard production slippage trend. Clicking on one of the items in table (D) opens the downtime-reasons dashboard (E) which outputs a detailed list of downtimes with start and end time, duration and reason for the selected machine and period.